Lieutenant Frederick Stanley Gordon (Royal Air Force) achieves his fifth victory when he shoots down an LVG C over Estaires. Lieutenant Commander Victor James Bowden-Smith (HMML #403, Royal Navy) is killed at age 31 when his ship is blown up in Runswick Bay while endeavouring to salve a German torpedo. He is the son of the late Reverend F H Bowden-Smith. Second Officer Alfred Buchanan Cheetham (SS Prunelle, Mercantile Marine) is killed at age 51 when his ship is sunk after being torpedoed. 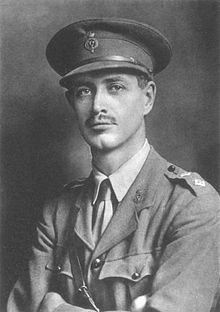 He was a member of several Antarctic expeditions and served as the third officer for both the Nimrod and the 1914 to 1917 Imperial Trans-Antarctic Expedition. His son William Alfred Cheetham was killed at sea when SS Adriatic disappeared in 1916. Eleven others on the Prunelle including the master are also killed. Captain ‘the Honorable’ Oswald Cawley (Shropshire and Cheshire Yeomanry) is killed in action near Merville at age 35. He is the son of the 1st Baron Cawley of Prestwich a Member of Parliament. The Captain was elected Member of Parliament for Prestwich Division in February of this year to succeed his father and has had two brother previously killed in the Great War. Captain John Kenneth Samuel Page MC (Warwickshire Regiment) is killed at age 22. His brother will be killed next month. Lieutenant Hedley John Goodyear MC (Central Ontario Regiment) becomes the third son of Josiah and Louisa Goodyear to be killed in the Great War. He dies at age 31 and his two brothers have been killed in 1916 and 1917. Lieutenant John Algernon Wynyard Peyton (Norfolk Regiment) is killed in action at age 25. His younger brother has been killed in July of the previous year. Lieutenant (Acting Captain) Ralph Dominic Gamble MC (Coldstream Guards) age 21 is killed in action while leading his company into heavy fog and taking an enemy position without the aid of the tanks allocated to support him at Moyenville. He is the son of ‘Sir’ Reginald Arthur Gamble and brother-in-law of General ‘Sir’ Kenneth Arthur Noel Anderson KCB MC commander of the First Army during Operation Torch, the Allied invasion of Tunisia. Lieutenant Keith Herbert Clayton (Cambridgeshire Regiment) is killed at age 33. His son will be killed in the Second World War. Lieutenant Francis Charles Plowden (Shropshire Yeomanry attached Shropshire Light Infantry) dies of wounds received in action at age 40. He is the son of Lady Plowden of Plowden Hall. Lieutenant Tom Cecil Noel (Royal Air Force) is killed in action at age 20 when he and his pilot are shot down near Westroosebeke. He is a twenty-four victory observer ace. Lieutenant Norman Dunlop Galbraith (Highland Light Infantry) becomes the third son of W B Galbraith JP to die in the War when he is killed at age 22. Second Lieutenant M I Malton (East Kent Regiment) is killed at age 26. He is the son of the Reverend William H C Malton. Second Lieutenant Percy William Moss (Machine Gun Corps) is killed at age 36. His brother was killed in March. Second Lieutenant Percival James Flory (Bedfordshire Regiment) is killed in action. He has two brothers who will die in service this year. They are sons of the Reverend Henry William Flory Vicar of St Matthew’s Littleport. Chaplain James Herbert Reginald Lendrum MC (attached Royal Lancaster Regiment) is killed by a shell with three others while conducting a burial service at age 31. He was the Curate of Apsley End from 1913 until last year. Corporal L G Moore (Duke of Cornwall’s Infantry) is killed at age 23. His brother was killed in March 1917. Lance Corporal Reginald Mustoe (Gloucestershire Regiment) is killed at age 21. His brother was killed in April 1915. Rifleman Alfred Ernest Coomber (London Regiment) becomes the third son of George and Elizabeth Coomber to be killed in the Great War. He dies at age 40 and his two brothers have been killed in 1916 and 1917. Private John Stanley (Royal West Kent Regiment) is killed at age 19. His older brother was killed in November 1914. Private Ernest A Pettingale (Northamptonshire Regiment) is killed at age 18. His brother was killed on the first day of the Battle of the Somme. Private Stephen Lucas (Cambridgeshire Regiment) is killed at age 25. His mother is so distraught by his death she requests that his name not be included in the local memorial constructed after the war. Private Edward John Avery (Royal West Kent Regiment) is killed at age 23. His brother was killed in March of this year. Private Thomas Abbotts (North Staffordshire Regiment) dies at home at age 24. His brother was killed in action while serving in the same regiment in July 1915. Private Sidney Francis Hatch (Australian Infantry) is killed at age 21. He has three cousins who will be killed in action. Private Sydney George Bowden (Sherwood Foresters) is killed at age 21. His brother died of wounds in February 1917. Private Charles Edward Kennedy (Essex Regiment) is killed at age 19. His brother was killed in December 1914. Private Charles Jackson MM (Royal Fusiliers) is killed. He is the middle of three brothers who lose their lives in the Great War. Private Louis Brereton Jones (Middlesex Regiment) is killed at age 25. His brother will be killed tomorrow.